Up until now I tried to design a completely new object or at least modify/remix an existing design each day, but today my design time was spent learning OpenSCAD so today's print is just a set of things that are good to give as a small gift for someone who likes to fish: two Fishing Lures from sirmakesalot on Thingiverse and a Holey Coin-Op Bottle Opener from Day 7 of this blog. Big bonus when you're out on the water: The bottle opener *floats* !! Settings: The lures printed well "mouth down". 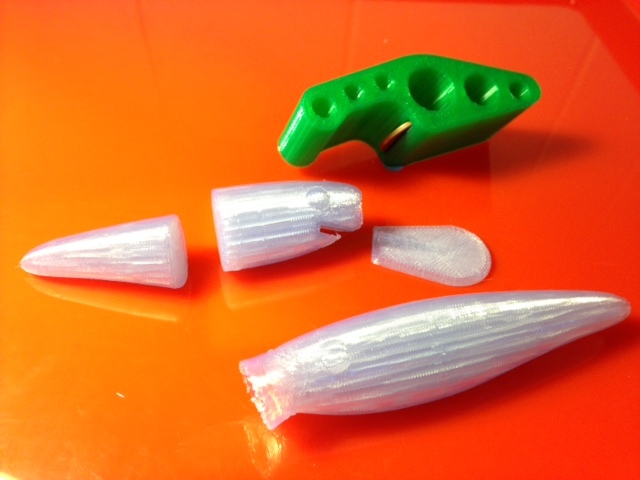 The three-piece lure printed without support or raft, but the popper lure needed a raft and supports at the base because it lay at an angle.